Florists all over the country will have been working away all week for one of their busiest times of the year, why? You hadn’t forgotten surely! It’s Mothering Sunday on 6th March. So where did this tradition come from? Buried somewhere beneath the cards and flowers lies a Christian tradition that goes back centuries. In America Mother’s Day is the second Sunday in May – and was official proclaimed “Mother’s Day” by President Woodrow Wilson in 1914. This resulted from a campaign by Anna Jarvis whose own beloved mother Ann Reeves Jarvis died 9th May 1905. The first unofficial celebration was in 1908 when Anna held a memorial for her mother in West Virginia. The tradition then came to Britain when Constance Smith who was a high Anglican, was inspired after reading an article about Anna’s campaign and decided that it should be celebrated in England in the 4th Sunday of Lent. And so it became oh so commercialised! Flowers are a delightful and fail-safe way to show your love, appreciation and gratification to the woman who bore you. There are so many places in London to grab a bunch of flowers including several florists near us Davis Brown estate agents, making Fitzrovia a brighter and more beautiful place to be! 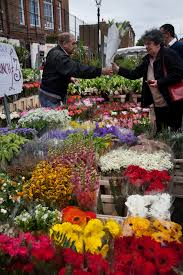 But if you want a real floral experience you could get up early on Sunday morning and head to Covent Garden Flower Market (confusingly situated in Vauxhall), or you could have a more leisurely mooch around Columbia Road flower market. Awash with colour and floral scents, it’s open each Sunday from 8am to around 3pm come rain, wind, snow or shine – a really fabulous day out in the east end of London. Columbia Road has plenty of great places to go for lunch too, my favourite being the Royal Oak, but make sure you get there early!